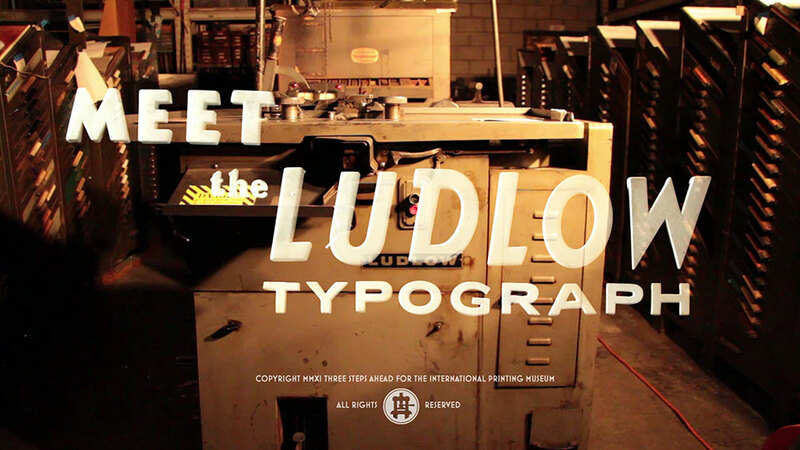 Meet the Ludlow Typograph. 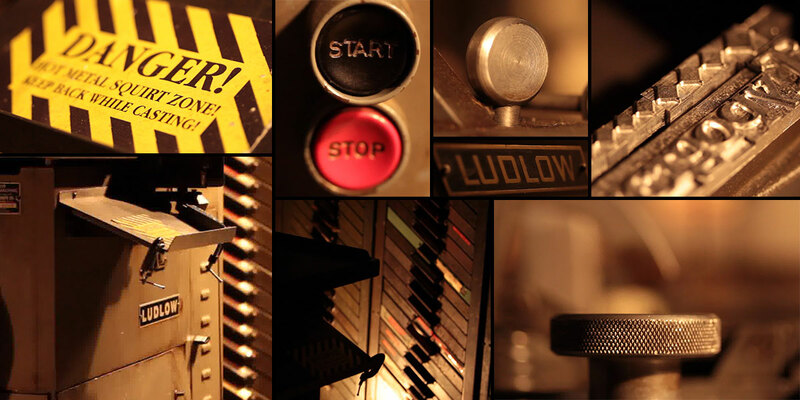 Still frame from The Ludlow Project Kickstarter appeal video (watch below). The Ludlow Typograph debuted at the very start of the 20th century, intended by its inventor, William Ludlow, to be an economical version of the Linotype. 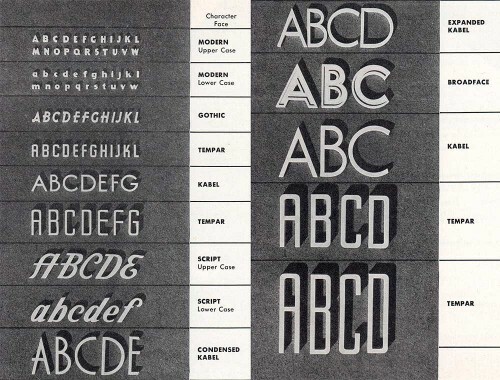 The Linotype had been around for decades by that point, and it had revolutionized the setting of type, which previously needed to be hand-done by swift, skilled typographers. While the Linotype is certainly not an easy machine to operate and maintain, its keyboard operation and its ability to cast reusable slugs (instead of precious, easy damaged foundry type) made it a huge game changer. It was the disruptive technology of its day, instilling fear amongst hand compositors, and allowing book publishers and newspapers to distribute their products more quickly and less expensively. Still, the Linotype was a huge investment with a big footprint, and smaller print shops (“job shops”) were not necessarily able to afford one. Besides the cost, though, the Linotype was not necessarily a great tool for decorative headlines; its strong suit was in setting large passages of body text. The Ludlow Typograph, on the other hand, could cast beautiful, decorative headlines at up to 240 points. It quickly became the must-have tool for setting headlines, and even ended up besting its competition in the long run, the Merganthaler All-Purpose Linotype. Out of the many machines we have at the Printing Museum, the Ludlow has a very special appeal to me, both because of its headline-oriented functionality, and because of the time in which it was most active—the 1920s through 1960s. The Ludlow had an amazing set of typefaces that were very much “of their day.” In addition to the more standard set (Bodonis, Garamonds, Caslons), Ludlow had some very cool Gothics, including R. Hunter Middleton‘s versatile Record Gothic family (completed between 1956 to 1961), and his somewhat Futura/Erbar-like Tempo family, completed between the 1930s and the early 1940s. Unfortunately, neither of them have been fully digitized, so the Ludlow is the only way to make effective use of those typefaces at the moment. I made use of the Ludlow’s Gothic offerings in creating slugs for my “Hello! My Name Is” letterpress name tags. We’re unfortunately very light on certain faces, especially in different sizes. 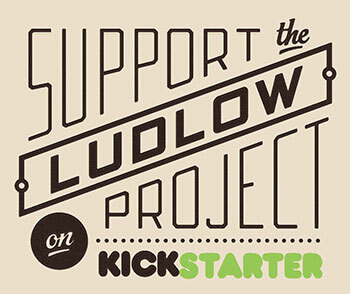 If we are able to raise enough funds through our Ludlow Kickstarter campaign, we’ll significantly increase the number of matrices that we have, and we’ll be able to cast lines for all manner of creative projects at the Museum. Additionally, we’re planning to give away some pretty amazing rewards for our backers, including custom slugs (your name in Ludlow! ), and limited-edition Ludlow-based letterpress prints. Much of this appeal video came together at the last minute. We had talked about many concepts for the video, but we knew from our experience helping with the Dodge Ram commercial at the Museum that the Museum’s collection looks fantastic when lit properly. So before we wrote a script, storyboard, or really planned much of anything, I did some lighting tests, mostly shooting racking focus clips with my EF-S 60mm Macro lens, mounted on my trusty Canon 7D. We have this beat up Coleman halogen work light that we use all the time at the Museum, and I used it on a whim to see how well it would light our subjects. Turns out it works really, really well, and I ended up lighting the entire video with that light. The initial test shots looked lovely, so from there all that was left was to write a voiceover script and figure out a storyboard. Easy, right? I stayed up very late one night last week writing the script, and then I recorded it using my Blue Snowball. The problem was, I sounded extremely boring. I was reading it like it was an NPR documentary. I was sleepy, and it showed. I sent the draft to my cronies at the Night Shift, and the feedback I got from Lizzy was that it needed some processing. She added some vintage background music and used a radio-like filter on my voice. Sounded better instantly, but it wasn’t there yet. Alyssa suggested that I re-record it using my imitation newsreel accent, somewhere in between old time radio like Captain Midnight and Franklin Delano Roosevelt. I had a really hard time not laughing at myself, but it worked. We found a Benny Goodman track from 1936 on archive.org that fit the bill, and it just so happened to be the exact length of the voiceover. Once the audio was cut together, I tapped out a rhythm of where the cuts should be in Premiere, leaving markers along the timeline. I wrote a basic shot list that corresponded to the markers’ timecode. I brought the list with me to the Museum, and spent most of a night hauling around my tripod and work light until I had everything I needed. 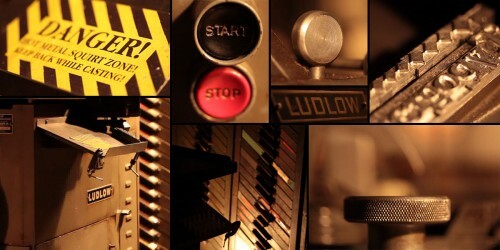 The next morning, I cut together the footage; most of it came together pretty well based on the shot list. The only major holes I had left in the timeline were for titling, which I figured I would typeset digitally. Alyssa suggested that I make use of my huge collection of Mitten’s Movie Titlers. At first I thought we wouldn’t have time, and I stupidly rejected the idea. As Alyssa is wont to do, she went ahead and typeset the titles in Mitten’s anyway, and the results were way beyond my expectations. So in the end, all of the titling (except the fine print) was done with the plaster letters, just as many movie titles were done back in the old days. For the beginning and end titles, I shot the letters on a black background, and composited the white letters over the darker footage for that double-exposed look. I collect movie titling letters of many brands. Most of my collection consists of the small handful of varieties of Mitten’s Movie Titlers, although I also have some later examples of Hernard title letters and Hollywood Titletters. The Mitten’s are my favorite, though. For one thing, their packaging was pretty nifty; they had branding down very well. Steven Heller, one of my design-history idols, wrote a short article for Baseline about Mitten’s which is worth a read. A few digital typefaces have been based on the letterforms of Mitten’s Movie Titlers, including Font Diner’s Featured Item and Jeff Levine’s Entitled JNL. At their headquarters in Redlands, California, Mitten’s also created Display Letters, sign letters intended for larger outdoor building signage as well as interior directional signage. Mitten’s Display Letters played a major role as inspiration for a building signage design for Brenton Hall in Narberth, Pennsylvania, a project I will be posting about at a later date. ← Diagonal: Fake Vertigo Poster? 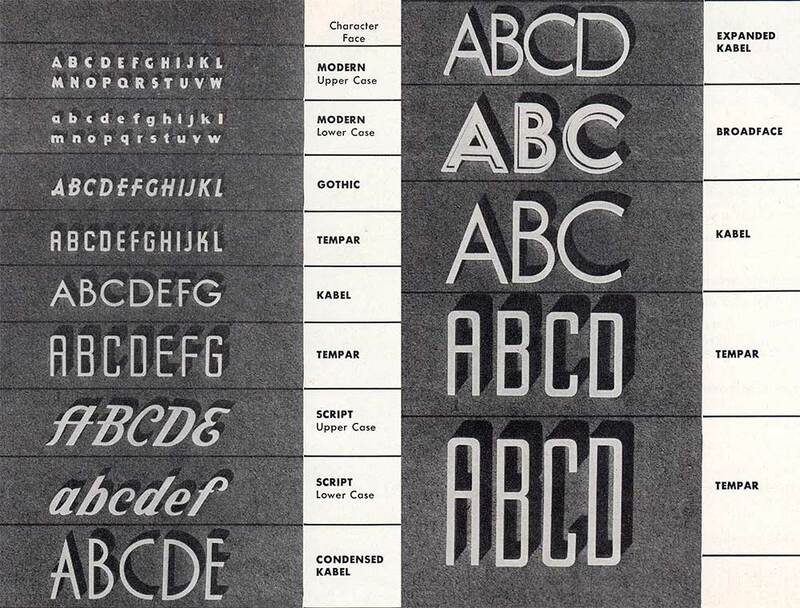 This shure is a neat,little article here, but the reason I am leaving this reply here is because I want to ask you if you could find some way to make these typeface styles from the second last picture available for download somewhere, because I really feel a lack of classic 1940’s fonts in my repertoire of typeface styles and these have just filled this empty void ,spelling “FOUND IT!”. That’s a complex request! 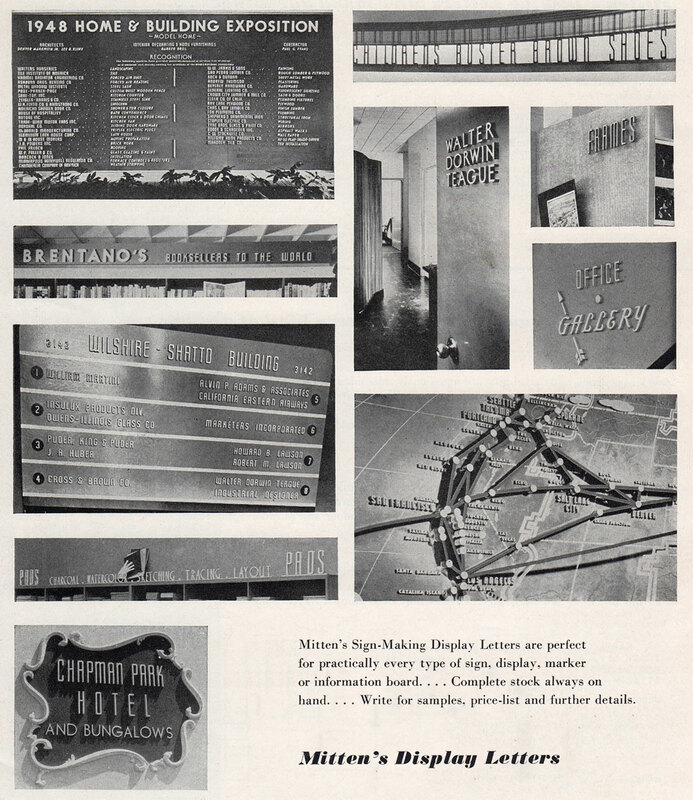 The letter styles shown in the Mitten’s brochure were produced specifically for their line of three-dimensional letters. There are many digital fonts that share common design aesthetics, but they may not be identical, per se. Here are a few that you might find useful, though. There’s Sign Shop JNL; Jeff Levine specifically referenced Mitten’s display letters for that family of typefaces. There are a lot of other similar faces here. Agency Gothic is a particularly appropriate match. Berber is another family that feels similar to the Tempar series. And Tasse certainly looks the part, even if it’s not a direct match to the Mitten’s collection. There’s also a Mitten’s series based on Kabel, which has been thoroughly digitized. Hope this is a helpful start! Hi I’m Chad! My girlfriend and I recently went to goodwill and found some mittens Movie Titlers and mittens movie Illustros which is a holiday character set that we cannot find anywhere on the web . Do you know anything about them?